University of California, Irvine physicist Henry Sobel has devoted his adult life to studying neutrinos – mysterious subatomic particles essential to our understanding of matter and the universe. So he was thrilled and honored to be flown to Stockholm by the Royal Swedish Academy of Sciences in December to attend the 2015 Nobel Prize in physics award ceremony. The prize was shared by Takaaki Kajita of Japan and Arthur McDonald of Canada for their roles in the discovery of a phenomenon known as neutrino oscillation. “It was an amazing experience and a unique moment to celebrate the tremendous advances that have been made in the study of the neutrino,” Sobel says. Neutrino oscillation was also the subject of research by five teams – representing institutions in Canada, China, Japan and the U.S. – sharing the 2016 Breakthrough Prize in Fundamental Physics, announced in late 2015. Sobel group members are on two of the winning teams and shared in a portion of the prize money. Frederick Reines, founding dean of UCI’s School of Physical Sciences and Sobel’s mentor, won the 1995 Nobel Prize in physics for discovering neutrinos. And detecting the specks, which are orders of magnitude smaller than electrons, is no easy task. Japan’s Super-Kamiokande, in which UCI is a major partner and which was used by the recent Nobel laureates, is one such device. Using 10,000 photomultiplier tubes submerged in over 50 kilotons of aggressively purified water, the Super-K enables physicists to study atmospheric neutrinos that shower down from above, as well as particles that reach the detector after traveling through our planet. The Super-K is also on the receiving end of multinational experiments in which neutrino beams are launched by particle accelerators at separate facilities more than 250 kilometers away in eastern Japan. Canada’s Sudbury Neutrino Observatory, operational from 1999 through 2006, was based on a system invented by UCI physicist Herb Chen, who died before he had an opportunity to see data from its detector. The complex apparatus consisted of 9,600 photomultiplier tubes submerged in more than 1,000 tons of heavy water. “The Sudbury and Super-K experiments contributed to physicists’ understanding of neutrino oscillation, in which one kind of neutrino turns into a different kind,” Smy says. Sobel and his colleagues are also members of large international teams working on two next-generation projects. One involves a liquid argon-based detector in a South Dakota gold mine that will be a target for a neutrino beam from the Fermi National Accelerator Laboratory outside Chicago. Detectors are placed deep beneath the Earth’s surface, often in decommissioned mines, to shield them from cosmic rays and other noise that can interfere with signals from desired particles. The other project is an expansion of the Super-K to be named the Hyper-Kamiokande because it will hold more than a megaton of purified water and over 100,000 photomultiplier tubes, a 20-fold increase over the existing detector. More personnel are needed as the lab’s involvement deepens in the intensive research projects. 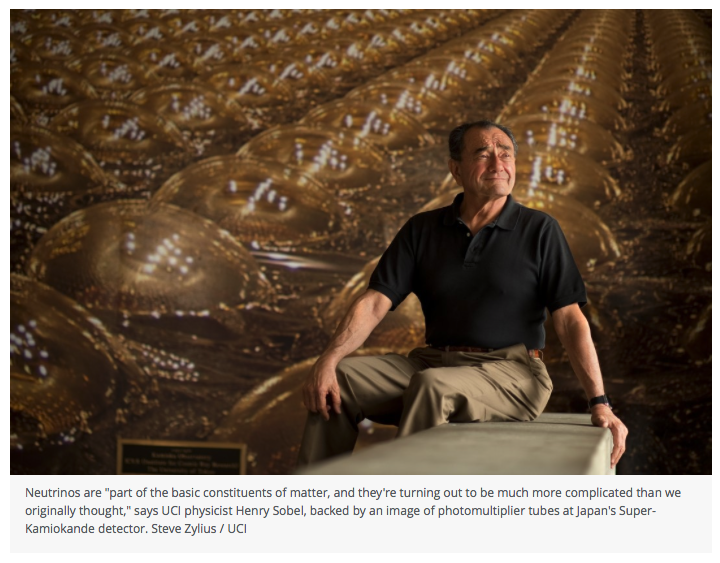 Fortunately, when it comes to recruiting talent, the Sobel team has an advantage over its competitors: a peerless history in experimental particle physics dating back to Reines’ work. “UCI is world-famous because of our neutrino program, and it all started with Fred Reines,” says Sobel, who studied under him as a graduate student at the Case Institute of Technology in the mid-1960s. Sobel was with his mentor in 1965 for the initial observation of atmospheric neutrinos, components of the shower of particles that occurs when protons in cosmic rays collide with oxygen and nitrogen atoms in Earth’s atmosphere. The discovery was made at the bottom of a gold mine in South Africa. That early-generation subsurface device led the way for other projects, most of which have involved UCI scientists and technicians. “Everybody knows the name Fred Reines, so you feel a responsibility to keep up the excellent work of the program he started,” Sobel says. UCI is world-renowned leader in experimental particle physics, especially neutrinos.